June M. Feezel at 407-920-0146 or Ross Feezel at 407-865-0433. They will be happy to talk with you about your next step to this worthwhile time spent volunteering with your special dog. We’d love to hear from you. Be An Angel Therapy Dogs Ministry dog/handler teams are very special people. 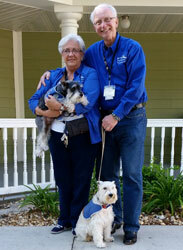 Some of the team members have been volunteering with their dogs for 10 years and others have just begun the experience. We give all the credit for our success to God, who has richly blessed our efforts. We are sharing the gifts that have been given to us by our Lord. Please feel free to either call us or send an email if you have any questions. Thanks!